- Luis Henrique was scheduled to face Timothy Johnson at the event. However, Henrique was removed from the pairing and was replaced by Marcelo Golm on December 7. 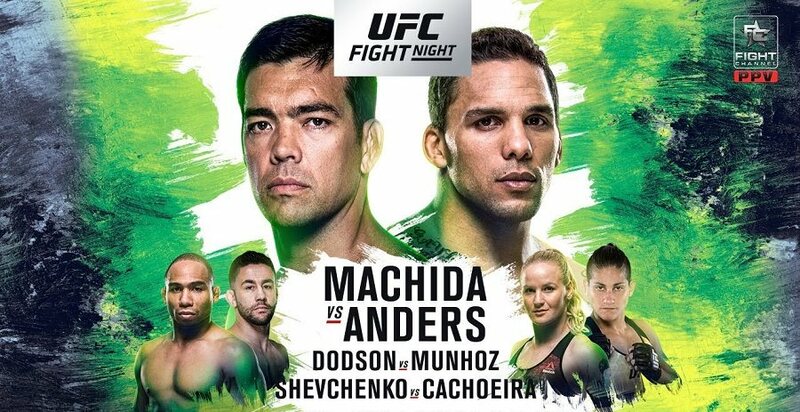 I have a bet on Douglas Silva ML at +120 and Machida KO at +480, I just have the feeling Machida will counter Anders since he goes wild sometimes. I'm starting to like Machida as well. I just hate how bad his chin is these days, especially after USADA. I'm only doing a few DraftKings teams this week, but each team costs more money than usual. I noticed I've been spewing a lot of money lately by playing in the "big" tournament each week, which everyone knows is a money pit and wastes a lot of money trying to get 1st place. That basically ruins all of my teams, so I made a last minute team for the 10 televised fights. I just realized it was a Double Up event I clicked on. So the most I can win is $50... I clicked on the wrong event it seems. Damn. I was confident in Alcantara pre-fight, but ended up adding Morales in several teams toward the end. Easy win for Alcantara over Soto. Wild, but nice performance by Thiago Santos. He ended it with a kick to the liver, but only his toes landed. I have Machida clearly winning a decision. Yeah Machida go! Wtf with the split decison. I only lost -$24 tonight. I cashed in the last minute $50 double up I joined. I checked the other tournament I thought I was entering, and I would've got 2nd place for $150 if I entered it, but I guess I was too slow or just clicked the wrong event. Anyway, not a terrible result since I thought I was dead after Joseph Morales got RAPED in the first fight of the night. Rounds 1 and 5 were clear for Machida, but it's not because he owned Anders. Anders got low kicked in R1 and fell down, and spent half or more of the round on his back with Machida kicking his legs to waste time on the clock. In R5, Machida actually threw strikes, and Anders didn't. Rounds 2, 3, and 4 could've gone either way in most people's eyes, but I consider myself unbiased and gave those rounds to Machida. In all 5 rounds, neither guy landed many strikes on each other. Machida spent most of the time circling and throwing strikes when he could, while Anders only throws punches (no jabs) + he isn't a good striker + doesn't know how to cut off the cage + not a good wrestler + probably started to slow down after walking after Machida instead of cutting off the cage like you're supposed to. Anders is only dangerous if he can get you to stay right in front of him, or if he can get his hands on you. He can't hurt what won't stay still.